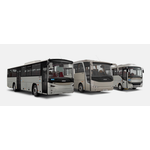 Otokar, Turkish leading bus and coach manufacturer, offers a simple and functional product range, with lengths between 5.8 and 12 meters, suitable for operators to optimize their fleet. This is contributing to their efficient operations and profitability. Otokar has been providing transport solutions for city, interurban and tourism to its customers since 1963. Otokar Europe SAS operates in many European countries including Germany, France, Greece, Bulgaria, Romania, Italy, the Czech Republic, Spain... with powerful distributors and a comprehensive after-sales service network.